A small synagogue in New York City's Lower East Side is reaching out to make people aware of its congregation's heritage through a museum that familiarizes people with its customs and history. 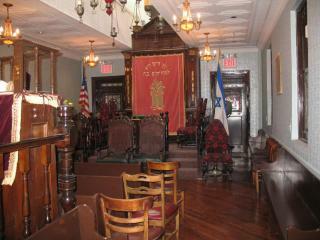 The synagogue is virtually unchanged since being built in 1927 by Romaniote Jews from Janina, Greece. In 2004, it was designated a landmark by the City of New York. Both memorabilia and the museum's tour guides describe the story of the Romaniote Jews, from their entry into Greece in the first century to their current life in America. Differences between Greek Romaniote Jews and the Greek Sephardic Jews who fled from Spain to escape the Inquisition are featured: The two groups speak different languages and have distinct customs.